My mum gave me this lipstick over Christmas time & I kind of forgot I had it until I saw it's pretty little packaging screaming out at me this morning. I have only actually worn it a couple of times before because it's one of those products that's so pretty you don't want to ruin it. How lovely is the packaging? I love the mint green swirl that goes around it. So I got this in shade 316 Rose Candy and it costs £23.50 on the Lancôme website (YIKES) but it's one of those products you will treat like it cost you that much. That's why I am afraid to wear it too often. It has a nice satin/really smooth texture to it and the first time I wore it was at home in Paris and it stayed on for my whole day, which is pretty impressive. The colour of this one is like a baby pink but because the texture is so lovely and luxurious, it doesn't look like a cheap baby pink if you know what I mean (by cheap baby pink I mean one of those baby pink lipsticks you get in teenage magazines). 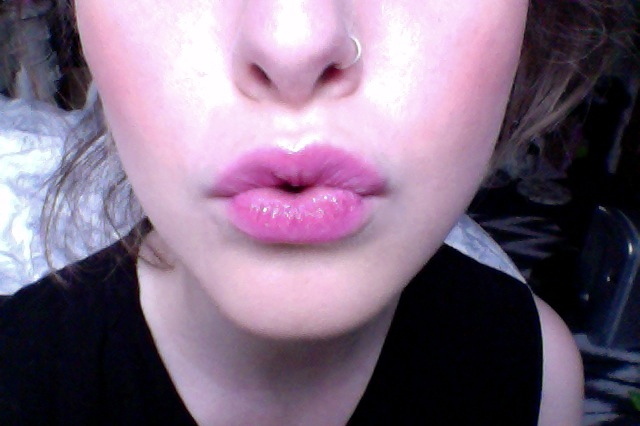 It feels super soft and moisturising on the lip (although I am not sure if it actually is moisturising at all). I really, really want the Sweet Marmalade shade now, which is a nice tangerine colour.